Congratulations to Kathy Oliver McClelland, from Chapin, SC, for winning the naming contest for Caroline's weekly sports blog posts. Kathy's parents live in Clemson and driving up on Saturdays for Clemson games is a family tradition. Caroline's blog posts will be called...drum roll please.... Caroline's Tiger Pause! Thanks to all the Clemson Girls for your submissions. Caroline's first intro post will be posted later this afternoon - so be sure to check back with the blog later today. 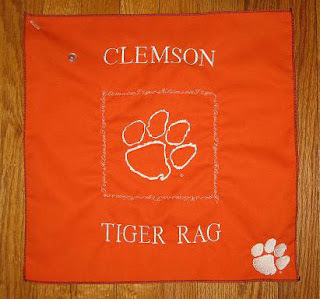 Kathy has won a unique Clemson prize - a beautifully, embroidered 15 x 15" Tiger Rag from one of Clemson Girl's new sponsors, McHenry Stitchery, who sells their custom Clemson Tiger Rags at http://www.clemsontigerrags.com/. Thanks McHenry Stichery for the prize donation! Clemson Tiger Rags are great! You can even have your name put on them!! !